I wonder whether this season we will actually harvest any cherries? Much to my disappointment we didn't get a harvest last year. Some fruit bushes and trees on the allotment, including the cherry, are teasing me into optimism and have already produced buds. The new cherry - Stella - planted in a pot in the garden, however, shows no sign of any flower buds. I'm hoping that this is because it is a later variety but I have the feeling that as this is a new tree any chance of fruit from it next season is minimal. Circumstances have meant that not only was our last visit to the plot made on 16 December but also I've not got round to sharing the photos that I took at the time. Here are some just to give some idea of what is happening (or not) on the plot at the moment. The ground is still very wet and claggy; far too wet to do any serious work there. It looks like frost doesn't it? 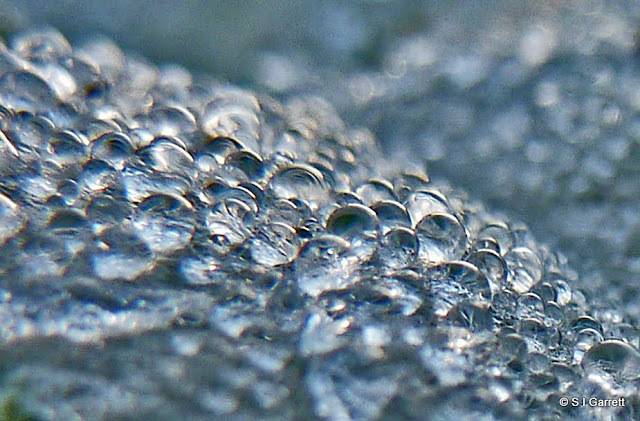 It isn't the ground is just so wet that it isn't drying out and what you see in the photo are water droplets on the surface. When we think about Christmas roses this isn't what we expect! The Hellebore Niger which we call a Christmas rose is neither a rose nor does it bloom at Christmas (well not in out garden anyway). Hellebore Niger often feature on Christmas cards but the title of Christmas rose really belongs to this flower. It's a rose and it was flowering at Christmas and beyond. Will have to take action soon! 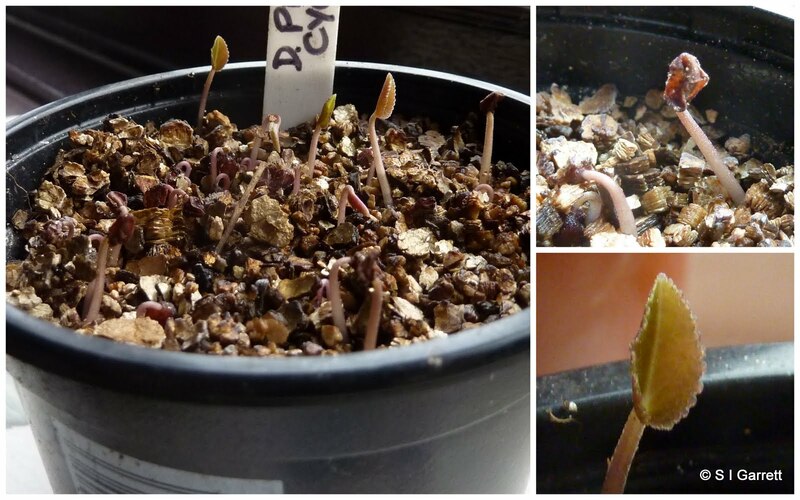 Do you remember that I sowed some seeds produced by my indoor, seed-raised, cyclamen? I posted about it here and here. The seedlings are growing very quickly now so I'm going to have to prick them out soon before they spoil. At the moment they look like cress. I know that already I have left them a little too long but circumstances have conspired against me, meaning that pricking out seedlings hasn't been high on my list of priorities. Do you also remember that I sowed another pot of seeds from a capsule that I found on the carpet? It had fallen from the plant and I didn't really rate any chance of the seeds germinating. Well these seeds are just starting to germinate! If you look closely you should be able to make out several tiny pink loops. 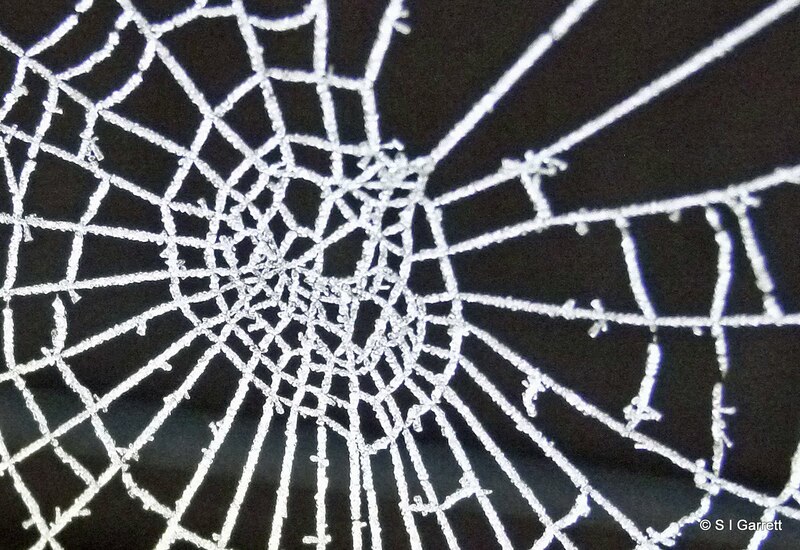 It's quite difficult to achieve a crisp photo as the camera insists on focusing on the vermiculite. 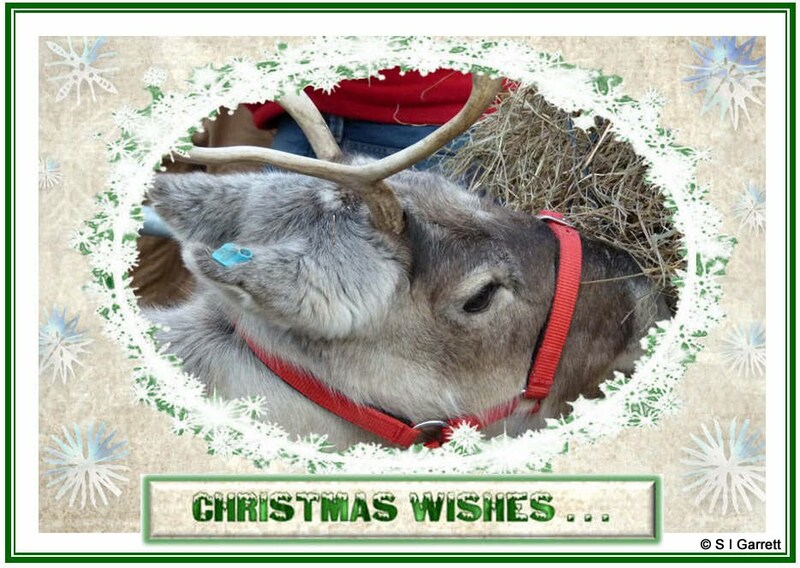 The photograph of the cute reindeer was taken in Carlisle town centre during one of our day trips out. She was stocking up for her busy schedule. Apparently all Santa's reindeer are female as the males lose their antlers in winter but the females keep theirs so they can protect their young. 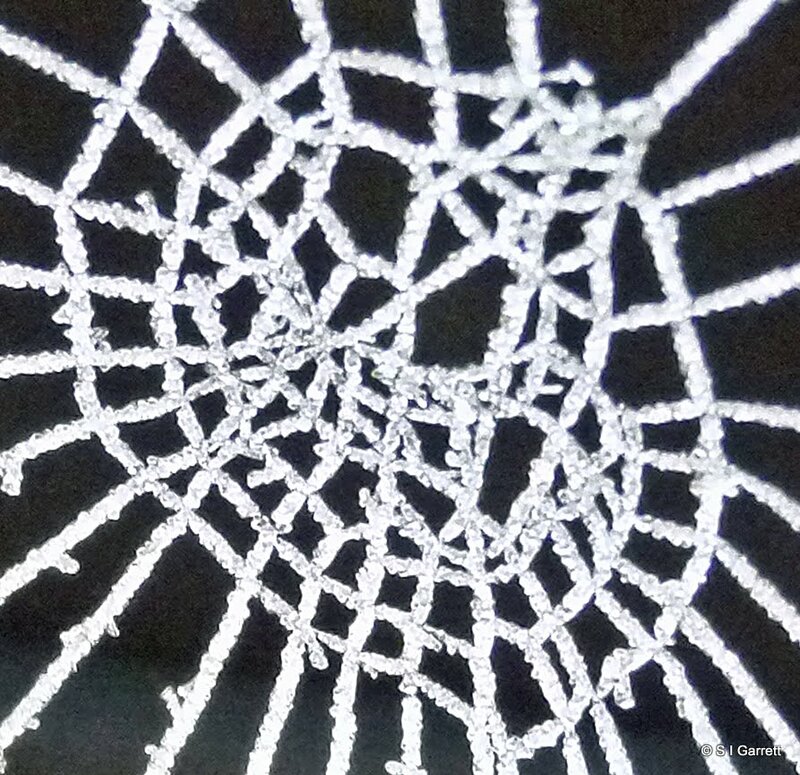 Best wishes for a Happy Christmas to all the visitors to both our blogs - thanks for your encouragement and support. I hope you manage to stick with us in 2013. We paid a quick visit to the plot on Sunday - mainly to replenish our vegetable stocks. We're still harvesting a reasonable amount of fresh pickings. The ground is still far too muddy for us to do any sort of gardening - everywhere is soggy and squelchy so it looks as though we could be in for a busy spring playing catch-up. The sogginess didn't stop me from wandering around taking stock and taking photographs. I was really keen to find out how the garlic planted directly in the ground was faring. As I mentioned previously, the garlic planted in a tub in the cold greenhouse has shoots. I planted two varieties Early Purple Wight (hard neck) and Provence Wight (soft neck) and on closer inspection it is just the Early Purple Wight that has shoots. I suppose being one of the earliest varieties to crop this was to be expected. 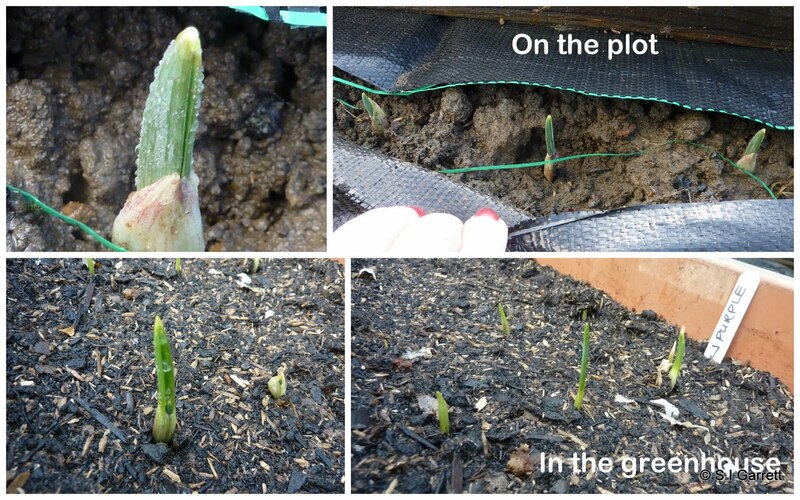 And was there any sign of garlic shoots on the plot - yes there was! Time will tell whether the plot grown plants will survive in the boggy conditions. In the same bed we have our autumn planted onions. 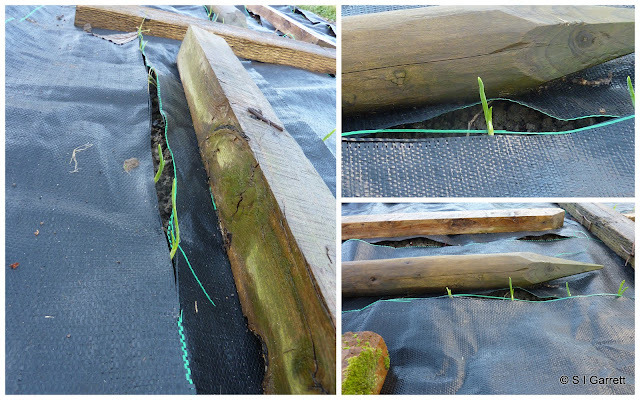 The sets, like the garlic, have been planted through weed control fabric. This is really an experiment and I was keen to find out whether. if the onions had managed to shoot, they had found there way through the slits in the covering. They had which was a bit of a relief. Last December our autumn planted onions looked like this. Last year we planted sets on 4 October compared to 14 October this year. This year we planted in wet soil and last year the soil was dry. We would have planted sooner but having ordered the sets online we had to wait for them to arrive. Now that it seems there are the same varieties available in garden centres next year we'll buy locally which should hopefully allow us to make an earlier start. Just to complete the allium round-up here's a photo of our leek bed. Still plenty to go at here - don't look at the weeds! So will we/won't we have a successful allium harvest? Who knows? 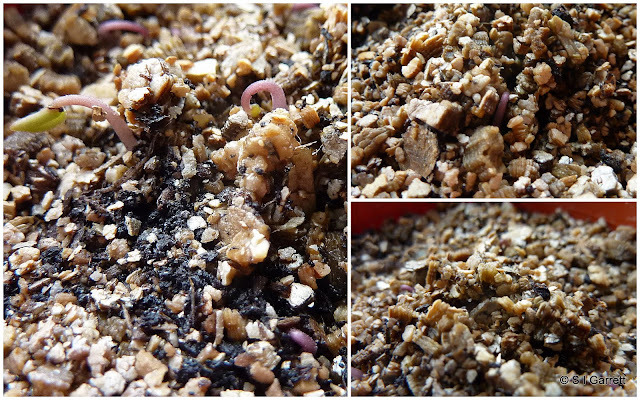 Do you remember that I posted about sowing some seeds that I had collected from our indoor cyclamen? That was only last month - you'll never believe it - I didn't - but many of the seeds have already actually germinated. Since sowing, the pot containing the seeds has been sitting on the windowsill of an upstairs room. Then I found another seed pod and so more seeds have been sown in the second pot in the background of the photo. I don't know which plant these came from as it had fallen off onto the carpet. Cyclamen seed capsules contain lots of seed but I had little confidence that many, if any, would germinate and so I popped the whole capsule full in a small pot. I looked at them every day and then one morning I couldn't quite believe my eyes. Overnight (or maybe, as I check the seedlings each morning, it was over-day) the seeds had germinated like grass. If I had expected such a successful germination rate I'd had sown far more thinly. Already the seedlings are at various stages of development. Shortly I'll be faced with the decision of what to do next? No doubt the seedlings will need pricking out but how many (can I restrain myself from pricking them all out)? Where do I keep them? 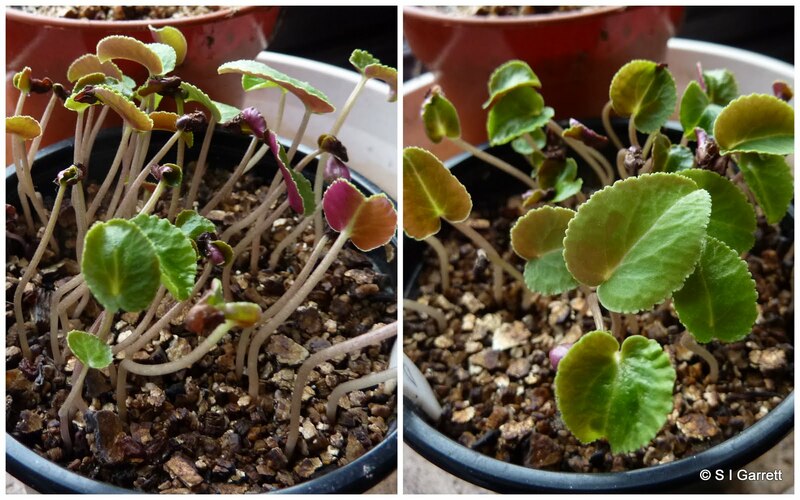 - Will the grow-light have to be employed? What about if the seedlings germinate in the other pot providing me with yet more seedlings of maybe a different colour? What do I do if a different cyclamen develops a temptingly plump seed capsule? A while ago Mal posted some sunset photos on his blog and I said that I had been taking sunset shots too. He came to have a peep at them on my blog and I hadn't posted them. To be honest I am always a little undecided as to whether to post non-gardening themed posts on this blog as somewhere or other I read a comment on another blog complaining about garden blogs that posted on other thing. To be honest I quite like to know a little more about the people whose blogs I read so I'm risking upsetting someone out there. After all they can just choose to not read this can't they? The 'sunsets' have a slight link to gardening as like the squirrel that starred in a previous post, they were taken at Clumber park which is a National Trust property that also has a walled kitchen garden. I write 'sunsets' as not all really class as such but as they are all evening shots I hope you will excuse the artistic license. 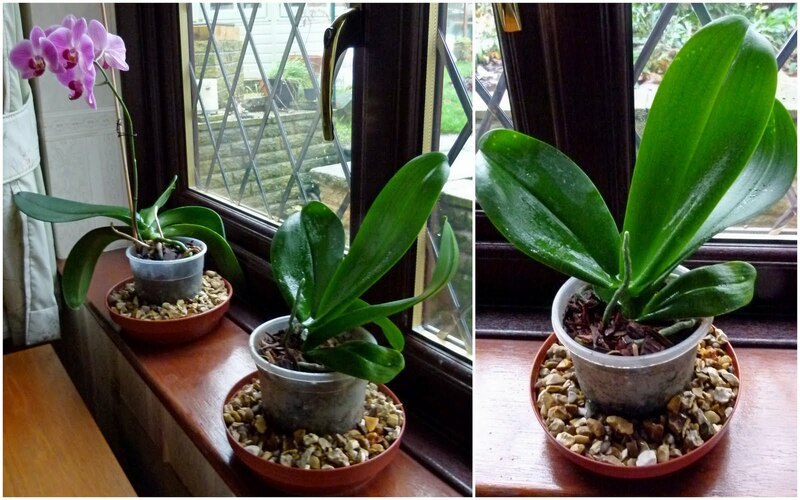 Do you remember in an earlier post I mentioned that one of my orchid plants was refusing to flower again? Well after a bit of research I started to wonder whether the compost that this orchid was planted in was to blame. The orchid that is flowering is in a compost that seems to be made up of mainly bark and the one that isn't was potted in this. So off I went to a local garden centre to try to find some bark compost - as you may have guessed this wasn't as easy as it should have been as the seasonal fairies had transformed everywhere and most signs of gardening items (unless they were of the sort that could be wrapped in fancy paper) had been spirited away. Not to be thwarted I consulted Amazon and found this Orchid Bark Compost . It was duly ordered and arrived last week and looks like this. Quite different from the compost that the orchid was planted in. When I tipped the orchid from its pot the original compost just fell away and revealed that some of the roots had dried out and shrivelled up but it also had some healthy roots. The dry roots have been trimmed and as many healthy ones as possible have been encouraged into the pot. Some had other ideas but that isn't a problem as orchid roots often prefer to be free of the compost. 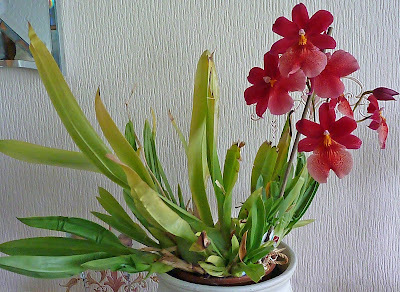 The orchid was given a good watering and then set in a plant saucer surrounded by gravel. It has been settled in on the windowsill with it's flowering cousin. Maybe it will get the idea. We'll just have to see whether or not it appreciates my efforts and rewards me with a flower spike - I'll let you know. Still on the subject of orchids, can anyone help a friend identify this orchid. Not being an orchid expert, as you may have deduced, my best guess is a Cattleya but I'm not convinced. Stop Press: We've just had a phone call from aforementioned friend. Guess what? - He's found a label in amongst the orchid leaves and the orchid is a Cambria. What can I say? 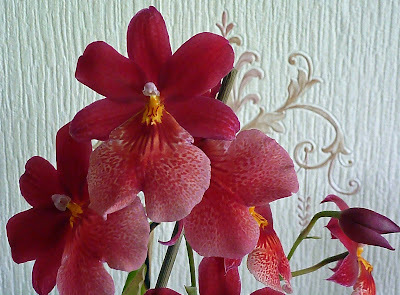 Val Micklethwaite from The Orchid Society of Great Britain to her speedy response to my email this morning, (before the label was found), who sent this information. 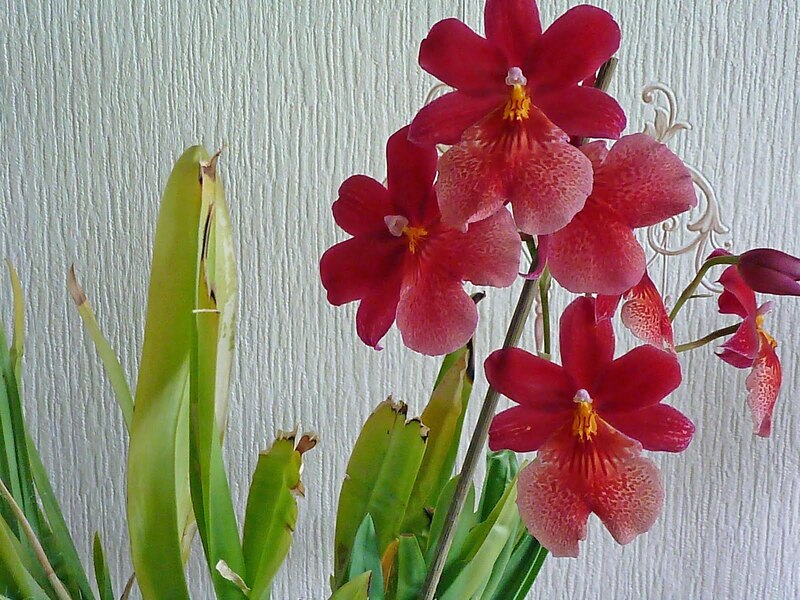 This is a cambria orchid and it looks like it is what was called Burrageara Nelly Isler. 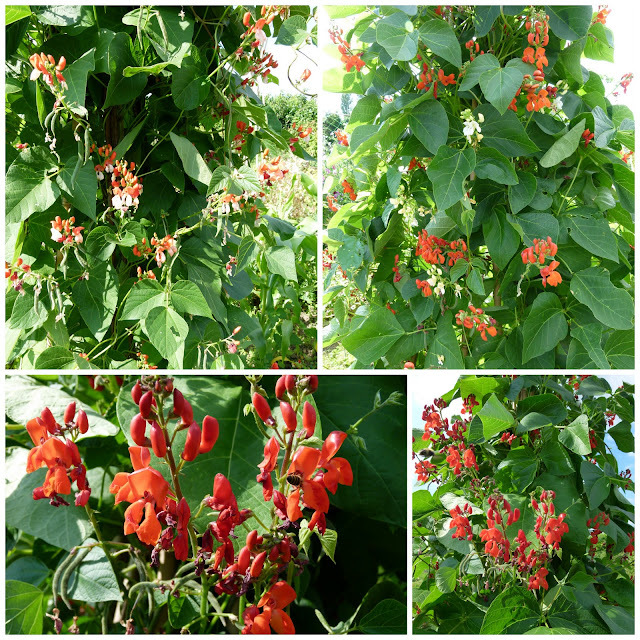 It has been reclassified recently to Oncidiopsis Nelly Isler, but you will find it on the internet under the original name. For the final post in my 2012 summary, I have saved the best 'til last. My star plot performers may not be the crops that have produced the most but the first batch I am awarding a B for better than expected. This in many cases means better than expected considering the weather conditions and how that affected my expectations. Firstly there were the runner beans. These didn't perform any better than normal but they seemed to shrug off the poor weather and just carry on flowering and cropping as though it was just an ordinary summer. As usual we gave up picking before they gave up producing. Then there were the potatoes which everyone was predicting were going to literally be a wash-out. In our heavy clay soil we figured that even if the weather didn't finish them off that the slugs would have a field day. 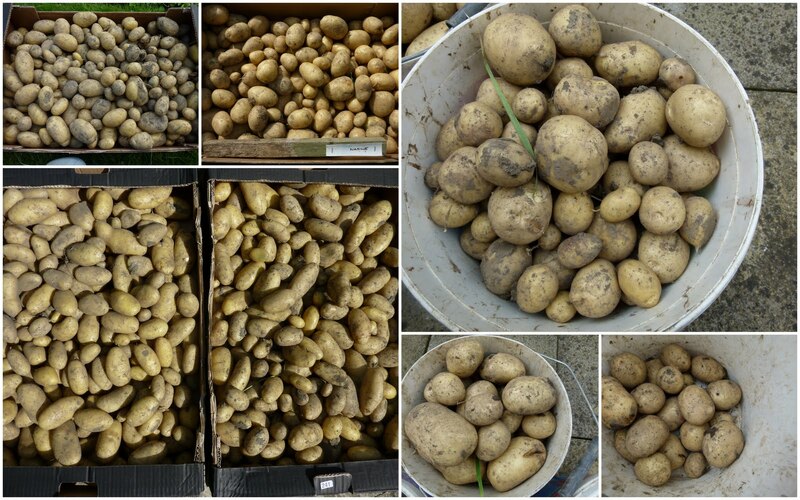 In the end, although the individual tubers may have been been a bit smaller, we ended up with an average sized crop. For producing a fairly average crop this year, potatoes deserve a B. I think the fact that we only grow first and second earlies and not maincrop varieties may have helped. A summary of how the varieties performed is here. 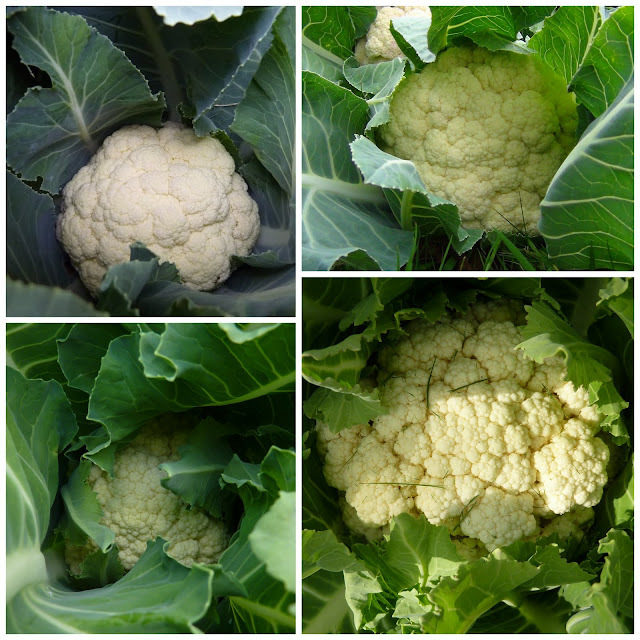 We were pleased with our cauliflower harvest - every plant produced a head which isn't always the case and the curds were surprisingly clean despite the battering they endured from the rain. 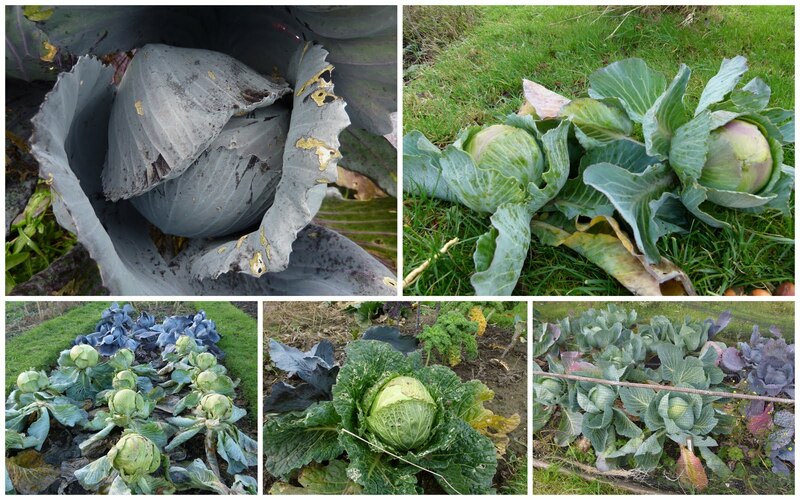 Cabbages too seemed to thrive in the wet conditions. We had expected to be assailed by the smell of rotting cabbages but were fortunately spared this delight. 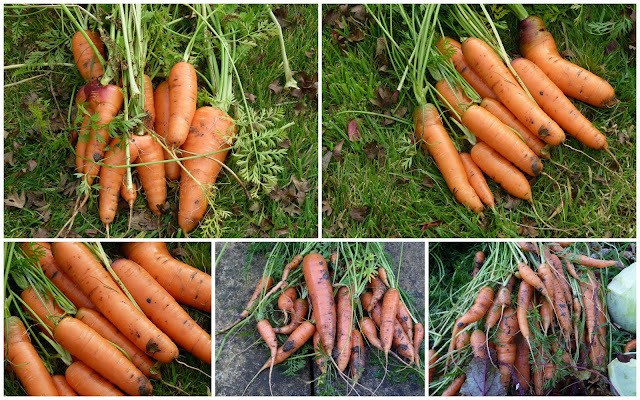 After last year's carrot disaster we have been more than happy with this year's crop which we are continuing to harvest. 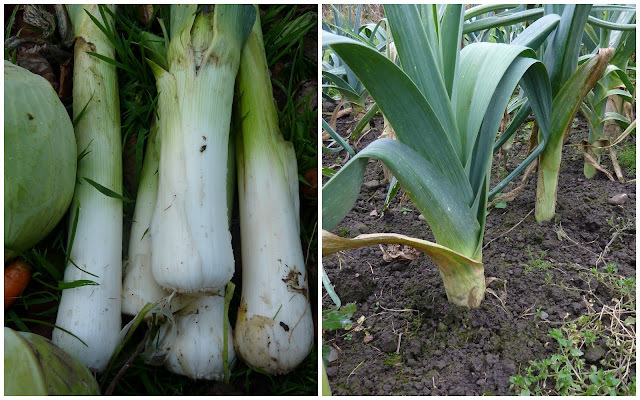 We started and now end the year harvesting leeks. It wasn't exactly growing weather when the leeks were planted but they have soldiered on to produce a good crop which will hopefully see us into next year. The stems/bulbs may not be the length of prize winning specimens but they are perfect for us. Then we have the vegetable that is used as a fruit. Last year we thought the really dry season (remember that) had killed off our rhubarb but thankfully phoenix-like it has resurrected itself and provided us with plenty of crumble material. Oh! 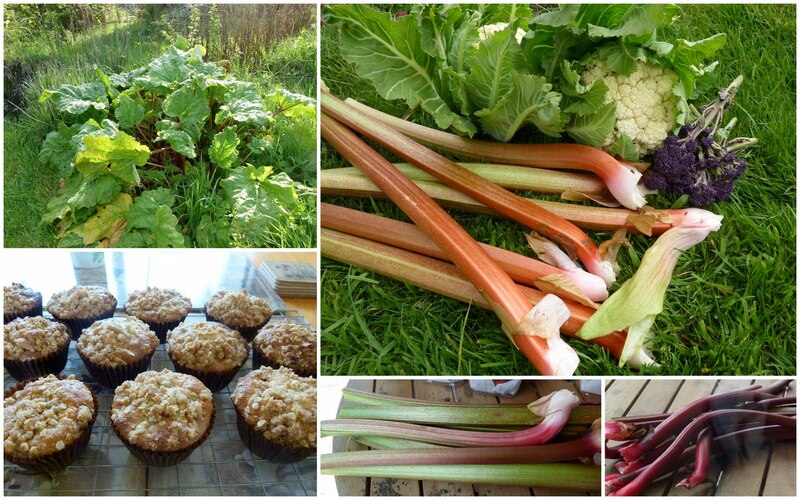 and not forgetting the rhubarb crumble muffins. When the fruit first set we didn't think that the redcurrants were going to do very well. They may have taken a little longer to mature and ripen but in the end we had plenty of redcurrants to pick and freeze leaving enough for the birds to tuck into when we had taken all we wanted. The last B grade performer is our newly planted Loch Ness thornless blackberry - a recommendation from Tanya - thanks Tanya. Being a new plant we didn't expect much of it this year but it exceeded expectations and is full of promise. 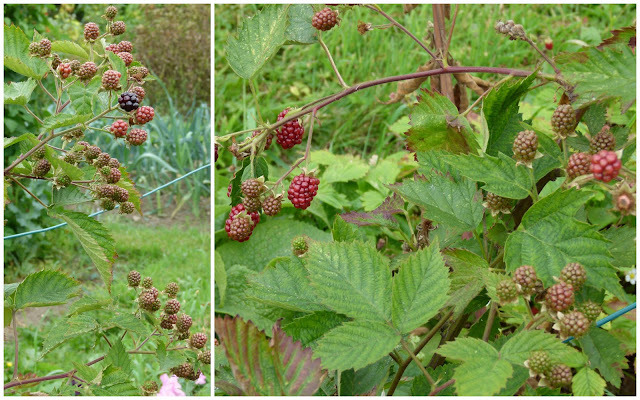 Picking blackberries is far less hazardous than it is from its thorny cousin. Now we come to the A listers. A for amazing. Just two plants in this category - both fruits - only the first is a fruit that we use as a vegetable. 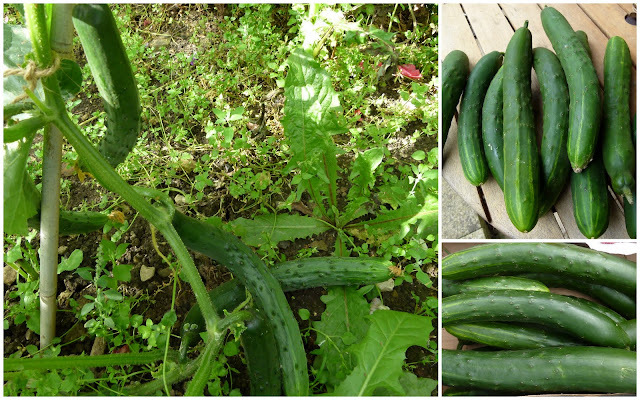 I really did not expect a bumper cucumber harvest this year. Not when summer was so cool - well let's face it cold. What is more amazing I am talking outdoor cucumbers here, not ones being cosseted in a cosy greenhouse. The plants produced fruits by the bucketful - so much so that I even had to resort to going door to door in my neighbourhood giving some away. 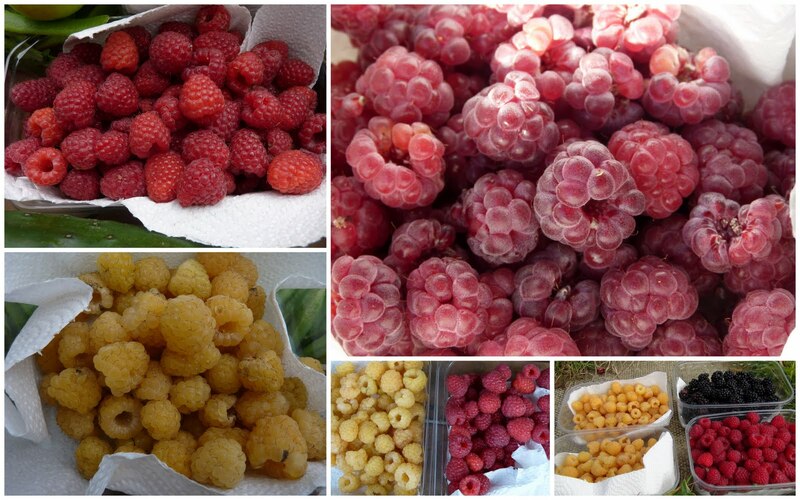 The other star performers were the raspberries, red, yellow, purple, summer and autumn fruiting. We started picking in June and the fruits just kept on coming. We didn't even protect the canes with netting and often disturbed feasting blackbirds when we approached to take our share. There was plenty for all of us. How the fruits didn't end up battered and bruised by the rain I'll never really understand. The yellow ones were even less spoiled than they have been in previous years. Its just amazing!